This week, from 11 to 15 March, officials of the European Commission and the Indonesian government are gathering in Brussels for the 7th round of negotiations on an EU-Indonesia Comprehensive Economic Partnership Agreement (CEPA). Internal documents from the European Commission reveal that corporate lobbyists have privileged access to the EU trade officials, allowing them to influence the course of the negotiations. CEPA is geared towards creating new market access, increasing trade in goods and services, and enhancing foreign direct investment between the EU and Indonesia. A sweeping project that primarily serves the interests of transnational capital, while putting increased pressure on human rights and the environment. This article shows which sectors and companies have the best access to EU officials and how CEPA will increase the uneven trade relationship between the EU and Indonesia. The EU and Indonesia have been negotiating a bilateral free trade agreement since July 2016. The trade deal sets out to strengthen their bilateral economic relationship. Yet, figures on current trade flows suggest that this relationship is highly imbalanced. In 2017, EU exports to Indonesia primarily consisted of machinery and appliances (32%), transport equipment (17%) and chemicals (13.1%). The main EU imports from Indonesia were animal or vegetable fats (19.4%), machinery and appliances (13.6%) and footwear, hats and other headgear (10.3%). This means that a disproportionate share of Indonesia’s exports to the EU consisted of primary and basic labour-intensive manufacturing goods, while Indonesia’s imports from the EU consisted primarily of more sophisticated and capital-intensive products. According to a draft study commissioned by the European Commission, CEPA would increase EU exports to Indonesia between 35.8% and 44%, while EU imports from Indonesia would only increase between 17.3% and 17.7%. Average tariffs in Indonesia are higher than in the EU. Also, restrictions on foreign direct investment in Indonesia are substantially higher than those in the EU. Mutual elimination of tariffs and other barriers to trade and investment will clearly provide a greater proportional advantage to European producers and suppliers. The trade deal is likely to lock in this asymmetric trade relationship and strengthen Indonesia’s role as a supplier of primary and labour-intensive materials. Most notably, CEPA is expected to lead to growth in the Indonesian clothing, apparel and footwear industries. Indonesia’s relatively low labour costs and the availability of cheap industrial land makes it an attractive market for foreign investors. Numerous global brands have established manufacturing plants in Indonesia as part of their global value chains. The sector employs over 4 million Indonesian workers, with a vast majority being women, accounting for 26.6 per cent of all manufacturing jobs in the country. Elimination of tariffs and other barriers to trade would increase Indonesian exports to the EU in textile (50%), wearing apparels (77-78%) and leather products (51%). At the same time, these sectors in Indonesia are characterised by poor working conditions, including low wages, low levels of minimum wage compliance, high levels of precarious employment, harassment and abuse, and gender discrimination in wages. The expansion of Indonesia’s garment sector would put added pressure on the environment, notably through increased water consumption, toxic waste, greenhouse gas emissions and deforestation. CEPA will also have an impact on the bilateral trade flows in palm oil. Indonesia is the world’s largest producer and exporter of palm oil, accounting for 55 per cent of global production and 62 per cent of global exports in 2017. The EU is the second largest importer of palm oil worldwide, sourcing 51 per cent of its imports from Indonesia. Through trade diversion away from third countries, the trade deal is expected to result in an additional 21.4 per cent of Indonesian palm oil exports to the EU. While demand for palm oil in the EU is growing – palm oil is used widely, ranging from food and cosmetics to biodiesel – the palm oil sector in Indonesia is associated with labour rights violations, environmental destruction, land-grabbing and deforestation on a large scale. Palm oil remains a lucrative business for global investment funds, while voluntary schemes to enhance its sustainability have proven to be ineffective. The trade deal may also undermine EU efforts to increase renewable energy use. Indonesian officials have already pressured various European legislators to weaken EU legislation on crop-based biofuels. Research shows that organised business plays a crucial role in the making of EU trade policy. Corporate lobby groups tend to have privileged access to the European Commission during trade negotiations, with trade officials often actively soliciting input from business – a phenomenon also known as ‘reverse lobbying’, whereby the European Commission lobbies business to lobby itself. This structural bias of the European Commission towards the interests of transnational capital is one of the key aspects of the neoliberal European integration project. The close links between the European Commission’s Directorate General for Trade (DG Trade) and big business are also manifest in the EU-Indonesia trade negotiations. Internal documents released by the European Commission, in response to a request by SOMO under the EU’s rules on access to information, already reveal that major transnational capital actors are currently mobilising to influence the trade talks. The majority of documents has not yet been released, even though the request was submitted more than seven months ago. But a preliminary list of meeting reports shows that of the 72 meetings between DG Trade and stakeholders between January 2016 and August 2018, 57 (79%) were with business and only 9 (13%) with NGOs. No meetings with representatives of trade unions or small and medium-sized enterprises have been reported so far. The remaining 8% of meetings were with other actors such as consultancy firms, think tanks and intergovernmental organisations. For a full overview of the gathered data, see here. Business associations representing cross-sector interests are lobbying the most. BusinessEurope, Confederation of British Industry, EU-ASEAN Business Council, Eurocham Indonesia, Eurocommerce, Japan Business Council in Europe, KADIN Indonesia and VNO-NCW all have had meetings with DG Trade officials. Lobbyists representing the clothing industry (European Branded Clothing Alliance, European Federation of Sporting Goods Industry, and Nike), food and beverages (Heineken, Herbalife, Pernod Ricard, Spirits Europe, and Unilever), and the palm oil sector (Golden Agri Resources, Council of Palm Oil Producing Countries, and Fediol) are also actively reaching out to the European Commission. These sectors reflect the key commercial interests behind the EU-Indonesia trade deal, as they stand to gain the most from further trade liberalisation. Nike (5 meetings) is a US multinational corporation specialised in sportswear and the world’s largest supplier of athletic apparel. With a total revenue of more than 34 billion dollars, it ranks number 89 in the 2018 Fortune 500 list of largest US corporations. Nike seeks to expand its business in Indonesia as part of its global supply chain and has a key “interest in improving access to the EU market”. DG Trade officials have invited Nike lobbyists to send in factsheets of encountered non-tariff barriers to trade, which could then potentially be considered for elimination. BusinessEurope (4 meetings) is the European employers’ federation and one of the most powerful lobby groups in the EU. It represents 40 national business federations from 35 European countries. The influence of BusinessEurope on EU trade policy-making processes, including the TTIP and CETA negotiations, is widely recognised. In a private meeting, DG Trade officials ‘encouraged’ BusinessEurope members to “provide input on the ongoing FTA negotiations with […] Indonesia”. Spirits Europe (4 meetings) represents European producers of spirit drinks with a membership of 31 national associations in 24 countries as well as leading spirits producing companies, such as Bacardi-Martini, Gruppo Campari, and Pernod Ricard. These producers stand to benefit from improved market access afforded by CEPA, for example by the lowering or elimination of Indonesia’s discriminatory excise taxes to imported alcoholic beverages. European Branded Clothing Alliance (EBCA) (3 meetings) is a coalition of European and global retail clothing brands, representing more than 60 brands such as H&M, Ralph Lauren and Levi Strauss. During behind-closed-doors meetings with DG Trade, the EBCA has targeted, among other things, Indonesia’s production and testing standards as well as import procedures, which it considers ‘lengthy and cumbersome’. Golden Agri Resources (GAR) (3 meetings) is a palm oil company that is part of the Sinar Mas Group, one of Indonesia’s largest conglomerates. In 2017, GAR was cultivating more than 500,000 hectares of oil palm in Indonesia, spread over 172 palm oil plantations. GAR has been a member of the Roundtable of Sustainable Palm Oil (RSPO) since 2011 and one of its directors sits on the RSPO Board of Governance. Nevertheless, the company’s operations in Indonesia and elsewhere have caused many controversies, including persistent and well-documented allegations of deforestation, land grabbing and human rights violations. In February 2019, the company was removed from the Dow Jones Sustainability Index after the arrests of three of its executives for bribery and corruption. Who scripts EU trade policy? This intensive corporate lobbying fuels suspicion about who is actually writing EU trade rules. The European Commission claims that further trade liberalisation generates economic growth and employment. 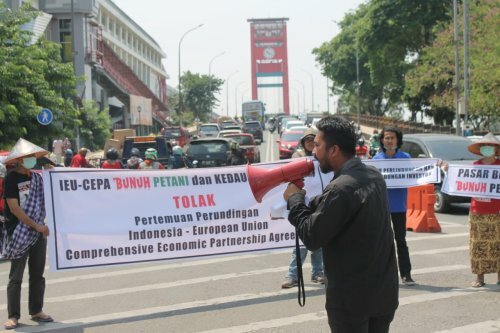 Yet with their one-sided focus on enhancing market access and granting investor rights, and disregard for the voices of workers, consumers, citizens, small and medium-sized enterprises and environmental groups, trade deals like the EU-Indonesia CEPA clearly are mainly designed to serve the interests of transnational corporations. Instead, the EU and the Indonesian government should develop ambitious joint standards for the protection and enforcement of international climate, environmental, labour and human rights obligations, as well as for the governance and accountability of transnational corporations, to ensure that CEPA truly contributes to sustainable development.